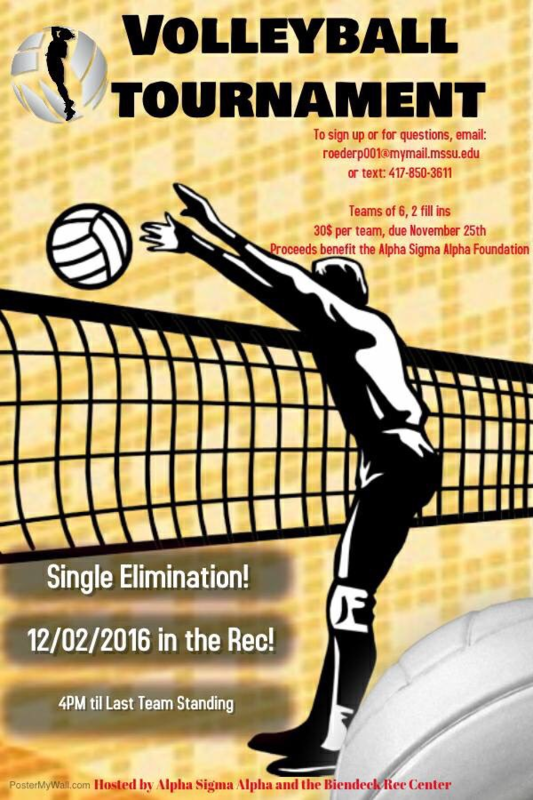 Alpha Sigma Alpha will host a volleyball tournament starting at 2 p.m. Friday, Dec. 2, in Beimdiek Recreation Center. Teams of six people and two fill-ins are sought. Students, faculty, staff and alums are invited to form teams. The tournament will continue until only one team is left standing. Cost is $30 per team, with payment due by Nov. 25. Proceeds will benefit the Alpha Sigma Alpha Foundation, which raises funds for scholarship, educational and leadership grants as wells as member advancement. For more information, text 417-850-3611 or email roederp001@mymail.mssu.edu.